Hey guys. 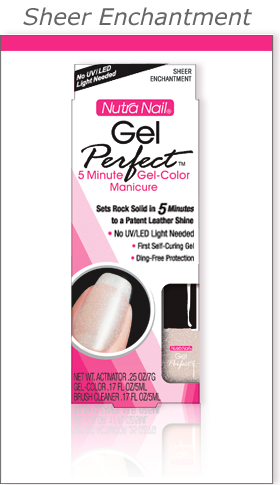 It’s time for another guest post from the hilarious and talented Katylynn! This is it. Your one stop shop for every shoe you will need this summer. Happy reading….and shopping. There are certain undeniable signs of summer that can only escalate your excitement for beach weekends and suntanned skin. Pulling your basic tee shirts and denim cut-offs out of winter retirement helps; the smell of fresh cut grass; sure, we could even argue that longer days filled with more sunlight is a pretty good indicator that summer is here. Nothing however gets me more excited for the season of sun than the first signs of exposed (hopefully pedicured) toes infiltrating the city streets. It’s the prime indicator that artic winds are behind us and there’s no longer a need to cover every inch of skin from your toes to your nose. And of course when your beach days come to an end (I know, it pains me to think about it too) – the undeniable nostalgia of summer that your season’s best fit sandals provide, along with their perfectly sand-weathered comfort – will ultimately carry you through a few balmy fall days when you really want to push out the stretch of summer surf weather. Without further adieu, from my sole to yours, below is a compilation of my top kick picks for the season. I’m by no means suggesting you do away with your tried and true flip flops, merely offering a few substitutions for when you’re feeling the need to induce a little extra pep in your step. After all, having a few summer shoe options on reserve is a must. If we can’t count on the soles of our feet for stability and confidence – the very foundation of our literal ability to stand – then really what do we have left in the world? Espadrilles: I actually don’t think I’ve ever owned a pair of espadrilles. That’s about to change (just decided it’s only fair I buy them if I’m recommending them, so thanks for that excuse, Lindsay). 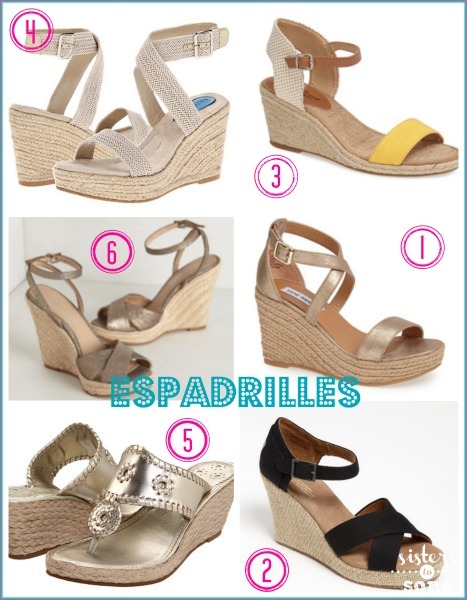 First, what can’t you wear espadrilles with? Rhetorical question, the answer is nothing: espadrilles look good with just about everything from tank top to skort set. 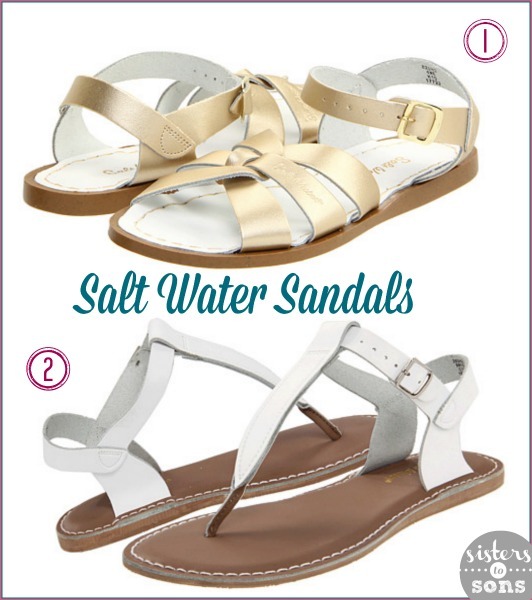 From flat versions to wedged, they’re pretty much the most versatile summer option out there aside from a flip flop. I mean they were the footwear of choice for Grace Kelly in “To Catch a Thief” and that says something for me. Silent, stylish, comfortable? Check, check, check. 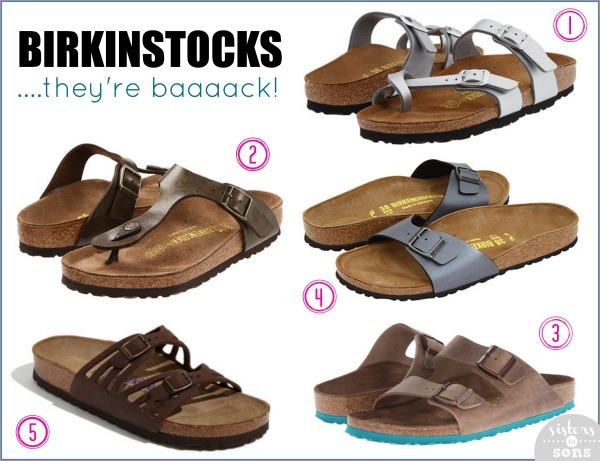 Birkenstocks: Berks are back, like in full force. They remind me a little bit of my dreadlock-sporting babysitter from elementary school who had an admirable (read as “annoying) dedication to saving the environment and a little bit of one of my high school lacrosse coaches who always donned them on the field over thick wool socks, but regardless I’m totally down with this resurrection from the 90s (big bangs and baggy flannels, stay back where you belong). I get it, the fashion industry is fickle and you’re afraid by the time you pony up and ride out of town with a pair of $135 sandals, the trend will be gone. But look, Chanel sent these down the runway during fashion week this year and they’re all over Celine’s summer catalog (by the way comparing Birkenstocks to Celine and Chanel really makes them seem much more affordable). These puppies aren’t called “Jesus sandals” for nothing; they’re here to stay for as long as I can tell. Bensimon Sneakers: These French kicks are comfy (and soft) enough to keep the blisters away even on the hottest of summer scorchers. They’re a staple that are slowly starting to work their way into my weekend rotation more than my Converses. I for one could not be more excited to embrace the tomboy trend that’s taking over (seriously, Vogue even sent a nice little mobile notification about it this week. BREAKING NEWS: Celebrate the Tomboy trend). These kicks perfectly balance a little feminine charm with the ability to run the bases like it’s nobody’s business at the drop of a bat. Salt Waters: If my house was burning down and I only had time to grab a few things, one of them would undoubtedly be my favorite only pair of feathered Catalina d’Orsay Manolos. That is by far the most obnoxious sentence I’ve ever written so let me explain: I found these beauties at a high-end consignment shop downtown and scooped them up without hesitation (despite a little heel scuff) for less than $150. They’re in pretty great condition and it honestly baffles me that someone living in this city gave them up. But hey, one man’s trash, right? Point is, these beauties are a little too superior to live in the confines of my closet next to the Old Navy flip flops – they require a little TLC to ensure the feather adornment stays intact and putting them within reach of my dog is a risk I’ll never be willing to take. These Manolos are just as much a decoration as they are a practical shoe (can shoes with feathers be considered practical? ); they serve as book ends, propping up a few fashion novels on a row of book shelves near our front door (ya know, so I can grab them on my way out in case of an emergency). This whole backstory is only really to explain that Salt Waters are not those shoes. No need to handle with care. In fact they’re made to be worn in and out of the water. The vulcanized rubber outsole grips onto all different types of terrain and the brass buckle will never rust. They’re your everyday shoe – a replacement to your trusty flip flops if you will. They’re adorable and they’re durable. Gladiators: There are two things I try to keep in mind when I’m getting dressed (like actually getting dressed, not just throwing on the same workday basics). 1: I want a mishmash of styles. I want to look like I had my dog pick out my bottoms and my fiancée pick out my top… in different rooms… maybe even with the lights off (I think this is how those Olsen girls get dressed). Now that I’ve lost all of your confidence in my styling ability, I will try to win you back by telling you that I’m really only hoping to discourage looking like I just walked out of one store completely dressed as its mannequin. If I’m going to wear a lace tank with a tool A-line skirt, I’m not trying to pair that with silk flats or I’ll look like I’m in costume for my “night at the ballet.” In this case of femininity, I’d reach for my Bensimon kicks to try and keep things a little more casual. In the summer, I typically find myself gravitating towards white linen dresses which of course are pretty feminine, but pairing that with a masculine shoe (what’s more masculine than a gladiator?) helps keep things interesting and (I think) even gives you a few extra points for individuality. I actually forget my second point now, so maybe that’s all I keep in mind when I’m picking out an outfit. 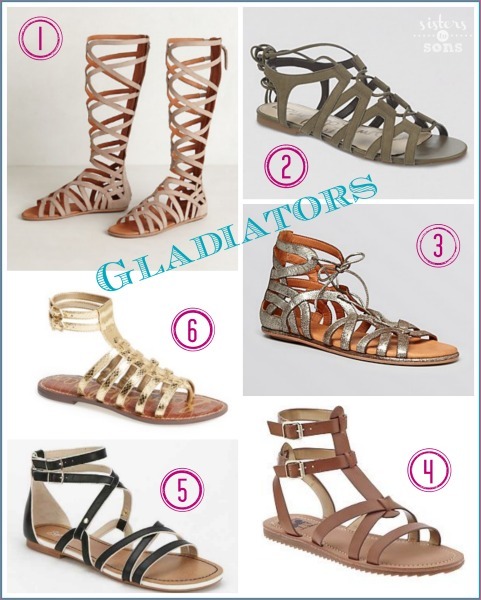 Look, all I know at the end of the day is that gladiators are named after some of the toughest people in the world, and that just not having them in your wardrobe arsenal is really a disservice to yourself. I’m putting my money on gladiators; even better, knee-high gladiators. Take me to the Coliseum. Yes. People wear these the knee-high ones in real life. 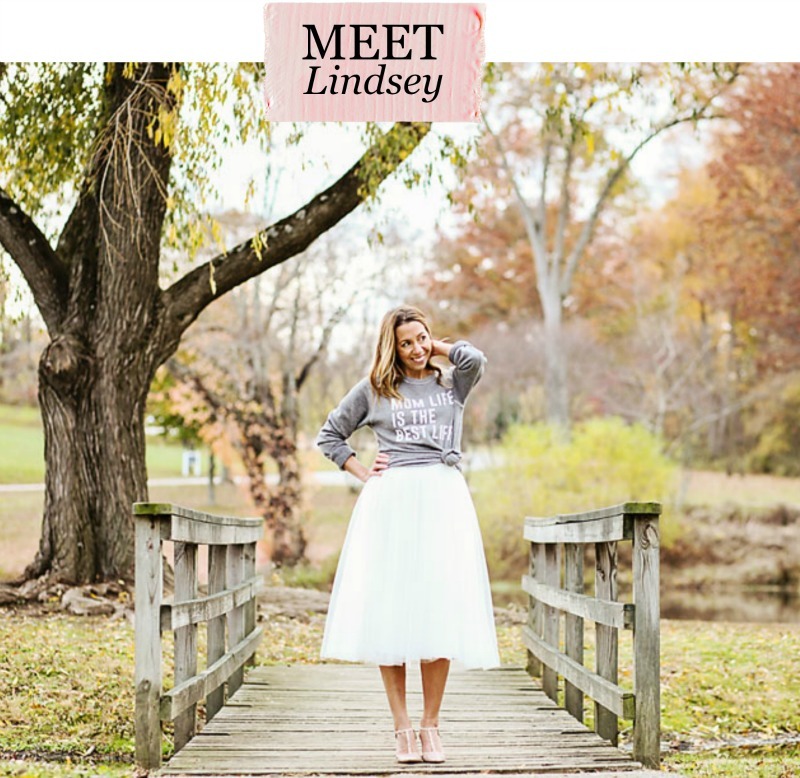 Lindsey’s sisters just wore them to her own bridal shower and rocked it. Wow. Want to read more posts by Katylynn? Check out her previous post on Cover-Ups here. Love all these suggestions. I have 2 pairs of espadrilles and I love them. Looking at my bare feet longing for ALL of these! Great post! I’m lucky to get out of flip flops:) I need to try to spice it up a bit with so may fun summer dresses! I am loving the espadrilles and the bensimons! I need comfy shoes! 10 Things You Need to Know About Having a Baby, for men.